Taking a break for quiz...I want to share something more closer to my heart. Have you had toys in your childhood that you had totally no ideal what cartoon they are from and what their names? You know they just look so cool and with actions that you just play for hours? Well I had some. Only recently I stumble on a website that I was reminded and realized those toy I used to own. 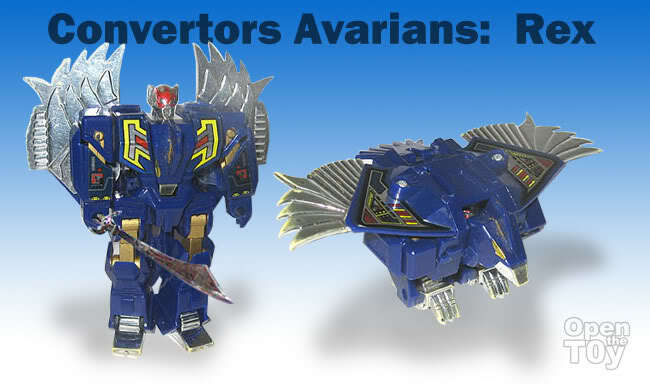 Convertors Avarians is a unique line of toy in the 1980. Why Unique? It is one toyline that do not have any cartoons or comic. Maybe because of that, I mistaken it as a Transformer... Ya anything robot that can transformed I will consider it as a Transformer when I was a kid. I felt in love with the series of toys...Not all of them, but two in particular. I was very much attracted by their alt mode (Bird mode) more than the robot mode. Of course the Chrome factor also play a big part in the pull factor. Rex attracted me with the Hawk mode. It just look handsome with blue body and the chrome wings and claw. Even the saber look wicked. Some history I found that was suppose to be on the card of the figure. "The greatest hunter of all the Avarians. He has great eye sight and can spot a Insector thousands of feet away. Once spotted, it is almost impossible to evade him." I remember using him as a good guy for spying on the bad guys in play time. Since I had good guys, definitely I need some Baddies. So poor Robat took on the role of the evil nemesis of Rex. The bat head and black tone gave me that impression of evil...but he is one cool toy. "The great inner earth fighter. Not a true Avarian, blinded by the suns rays, he had to land on Avarious. He was soon adopted by the Avarians. He sleeps at day to avoid the sun, and hunts at night. Robat can see in total darkness." I loved the transformation of from Robot to Bat mode. The hands and the Bat mask will be tugged away into his chest. I prefer the Bat head so much that I often left it on him even in robot mode. As time goes by, the chrome weapon and parts turned black and because of the way I played with it, the joints were loose and some were broken. Come one Spring cleaning day in my growing up years, I threw them away since I do not know how to restore the condition. When I came a upon the pictures of the toys toyarchive.com, the memories of many hours of my childhood fun just flush back to me. I finally learned their names and some history about them for the first time. I used to own a Robat!!!!!!!!!!!!!!!! Awesome posting that brings me back to the past fond toy memories! I used to have Rex the bird robot. These are real cool toys! Thank you Leon! Ha! Ha! Suddenly I got excited! I had a few of these as well. Many fond memories, I wish I still had them!